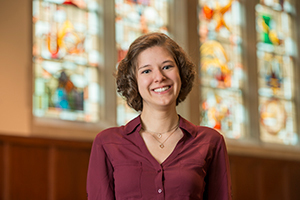 Abby Davis, a political science major from Avon Lake, Ohio, has been named valedictorian of the 2016 University of Notre Dame graduating class and will present the valedictory address during the 171st University Commencement Ceremony on May 15 (Sunday) at Notre Dame Stadium. A member of the Glynn Family Honors Program and Phi Beta Kappa Honor Society, Davis is also a Hesburgh-Yusko Scholar and has a 3.99 cumulative grade point average. She will graduate with minors in philosophy, politics and economics (PPE) and Russian. During her Notre Dame career, Davis spent one semester and two summers studying abroad, first at Daugavpils University in Latvia during the summer of 2014, immediately followed by a semester at the Pontifical Catholic University in Chile. She spent the summer of 2015 at the Derzhavin Institute in Russia taking intensive Russian language courses. Her undergraduate research focused on global migration, specifically how governments can effectively respond to the flow of people across their borders, and the politics of language laws. Davis also completed a senior thesis examining the strategic decision calculus behind Russia’s annexation of Crimea in 2014. Davis served as a student member of the College of Arts and Letters Academic Honesty Committee for more than two years and was co-chair of the University’s Code of Honor Committee, where she organized and led focus groups, providing input on the revision of the Academic Code of Honor standards and procedures. She also co-directed the University’s Russian Choral Ensemble and was a member of the Women’s Liturgical Choir. Off campus, she founded and participated in the Community Arts Initiative at the Center for the Homeless. The program provides free arts education, including weekly piano, guitar, violin, voice and dance lessons to the center’s guests. After graduation, Davis plans to work as an analyst for Avascent, a Washington, D.C.-based consulting firm that specializes in working with companies in government-driven industries. For the first time in 45 years, the University has named a salutatorian. The salutatorian will offer the Commencement invocation and will be prepared to deliver a valedictory address should the valedictorian be unable to do so. “Naming a salutatorian also allows us to recognize in a more formal way two outstanding seniors who will — in these distinctive roles — represent the virtues and ideals animating a Notre Dame undergraduate education on Commencement weekend,” said Hugh Page, vice president and associate provost for undergraduate affairs, dean of the First Year of Studies program and chair of the selection committee. This year’s salutatorian is Stephen Schafer, a finance major with a second major in economics, who has a 4.00 cumulative grade point average and is a Malpass Scholar. Through the Malpass Scholars Program, he has visited and interacted with top money managers connected with the University’s endowment. A native of Edgewood, Kentucky, he is member of the National Honor Society, National English Honor Society and Omicron Delta Epsilon international economics honor society. He also served as president of the Beta Gamma Sigma national business honor society. Schafer spent the summer of 2013 in China studying international business and the interaction between Chinese business management and culture. In 2014, he also participated in the inaugural Ireland Inside Track program in Dublin to gain insight into Irish culture. 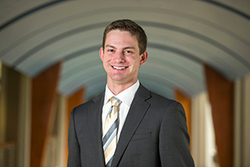 During his undergraduate career, Schafer worked as an intern in the University’s investment office, as a commodity sales and trading intern at British Petroleum and as an investment banking intern at Goldman Sachs in New York. Outside of the classroom, Schafer served as a project leader for the Student International Business Council (SIBC) and Investment Club, as well as a senior mentor for the Wall Street Club. Schafer was the vice chairman for Notre Dame’s Junior Parents Weekend and a member of his residence hall’s Freshman Orientation Committee. His service efforts included work at South Bend’s Center for the Homeless, along with serving as a volunteer at Hannah & Friends, the Covington (Kentucky) Soup Kitchen and Special Olympics. Following graduation, Schafer will return to work in investment banking at Goldman Sachs in New York City. Originally published by Sue Lister at news.nd.edu on May 02, 2016.